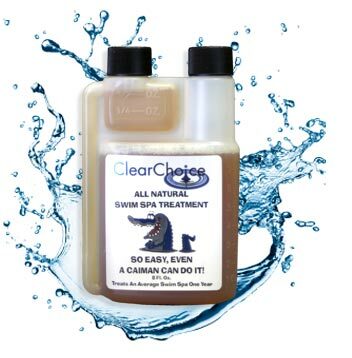 This natural, enzyme based Bio-Oxidizer is all you need to maintain a healthy body of water in your swim spa. No other harsh or toxic chemicals needed! This product also contains metal and mineral control agents which will protect all your swim spa components. An 8oz. bottle treats an average Swim Spa for one year. Ingredients derived from plants & minerals. Always store in a cool dark place away from kids and pets. ALWAYS PREMIX SWIM SPA TREATMENT IN ONE GALLON OF FRESH WATER. POUR THE MIXTURE AROUND THE PERIMETER OF THE WATER. RUN ALL SPA JETS FOR FIVE MINUTES TO DISTRIBUTE PRODUCT EVENLY. Dosage based on average size swim spa - 1200 - 1500 gallons. 1. ADD 1/2 OUNCE OF SWIM SPA TREATMENT TO WATER FOR THE INITIAL DOSE. 3. INSTALL A CLEAR CHOICE FILTER SLEEVE ON SWIM SPA CARTRIDGE FILTER FOR BEST RESULTS. 5.	pH: NEW USERS AND/OR NEW SPAS, MAINTAIN A WATER pH of 7.6 FOR THE FIRST THREE MONTHS. AFTER THREE MONTHS STOP ADJUSTING pH, LET THE WATER BALANCE ITSELF. USE ANY TRADITIONAL pH DOWN PRODUCT ALONG WITH TEST STRIPS FOR THIS PROCESS. 6. NEW SWIM SPAS & NEW USERS: ADD TWO BOTTLES OF “SPA PREP” AND FOLLOW THE BOTTLE’S LABEL INSTRUCTIONS, EXCEPT THAT SWIM SPAS DO NOT REQUIRE THE GARDEN HOSE “PRE-FILTER”. The Filter Sleeve enhances the filtering efficiency of the standard cartridge filter in your spa. It is designed to work with our Natural Swim Spa Water Treatment System. DIRECTIONS: Remove the spa cartridge filter from your spa. Wrap the Filter Sleeve around the spa cartridge filter and secure it firmly with the attached fabric ties. Reinstall the unit in your spa. The Filter Sleeve is designed to fit most spa cartridge filters. The sleeve is based on area coverage and may or may not cover your entire spa cartridge filter. Clean the Filter Sleeve weekly by spraying with high pressure water from your sink or garden hose. Monthly: Soak the sleeve in 1 cup of white vinegar for 1 hour, rinse well and then reinstall in spa.